Obverse: Eustace in full armour walking to the right, holding sword and wearing a Norman helmet. To the left two annulets with pellets between a four pointed pierced mullet. To the right of the helmet is an annulet with pellet. Text around EVSTACIVS. 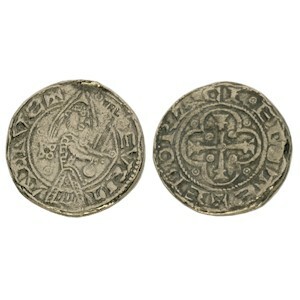 Reverse: Cross in quatrefoil, pellets in each quarter of both the cross and quatrefoil. Text around EBHORACI EDTS. History: FitzJohn was the lord of Malton and Knaresborough in Yorkshire. In 1138 he was accused of plotting with Matilda, and Bamburgh Castle was confiscated from him. He deserted to the Scots and fought against Stephen at the Battle of the Standard in 1138.